Coolest Name Ever? 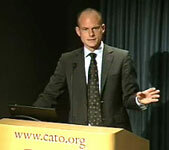 I noticed a few blog comments in the US about my Cato speech - see it here - and the following debate - for example here. At the blog of my co-panelist, Ezra Klein, there was a comment that caught my eye. Someone considered my name the "coolest ever", see here. The first time, I can assure you. Funny.